AN EFFECTIVE trades union protecting and promoting journalists is a prerequisite to a free and fair society. And the work of such a union is intensely and intrinsically political. That is why I will do everything that I can to ensure that the NUJ does not establish a "political fund" - as some members are currently proposing (see motions 104 on the Delegate Meeting Final Agenda). If that sounds paradoxical, then perhaps a step back will help? Levelling up the employment playing field so that workers aren't at the mercy of powerful bosses is obviously small-"p" political. Indeed, it is hard to think of anything that trades unions do of which that is not true. But from its outset, the NUJ has been a force in legislative politics too. In 1908, it promoted an Act of Parliament that gave journalists a right to attend council meetings. In 1927 it fought off legislation that would have made the reporting of some routine details of court proceedings illegal. In 1937 it held off the use of the Official Secrets Act to convict journalists. More recently, the most important principles of the Employment Relations Act 1999 (which created a right to trades union recognition) can be traced to NUJ campaigns in the preceding decade. Agitation on legislation affecting surveillance and data protection continues to this day. Such campaigning (and the above are only the highlights) has required the NUJ to work with whatever politicians shared our objective - a legislative environment conducive to effective journalism. Unlike most of the British trades union movement, however, the NUJ has never endorsed or been affiliated to a single party. The reason for this is obvious. For many journalists professional dispassion is incompatible with party affiliation, whether because of contractual requirement or personal conviction. Not only that, but the NUJ has long organised in multiple jurisdictions. English political parties do not operate in the Republic of Ireland, and the political choices available in Scotland, Wales and Northern Ireland mean that progressives face different choices depending on where they live. 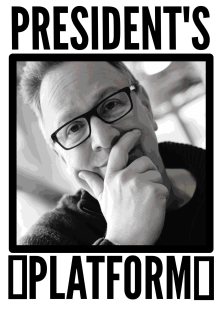 Why then, as we prepare for our imminent biennial Delegate Meeting, are three branches asking that we ballot members in the hope that they will support the creation of a political fund? Separate "political funds" (in their current form) the product of the 1984 Trades Union Act. Unions that wish to maintain such funds must ballot members at least every decade to obtain their consent for maintaining funds that exist for the following purposes (forgive the length of this text: it is from the face of the Act. Boiled into a sentence, political funds are intended to directly benefit or financially support political parties, or to campaign against a particular political party. Perhaps because the law is so clear, there has been only one prosecution of a trades union for failing to comply with the terms of the Act in the 35 years since it became law. In 1987, Nalgo, a forerunner of Unison, which did not have a political fund, ran a poster campaign during that year's general election. A court subsequently found that the main purpose of the campaign was to persuade voters not to support the Conservatives - a verdict with which it is hard to argue. So, unless the NUJ chooses to spend money, or deploy resources, to promote the electoral campaigns of a particular party, there there is absolutely no chance that it will fall foul of the law. Creating a political fund would have other consequences, however. Those who are enthusiastic to ballot on this subject are gently reassuring that they have no interest in affiliating to a political party. As a political fund has no purpose other than to support political parties, scepticism must surely attach to this. The moment that the NUJ does fund or promote the election of a political party, it is all but certain that a signifiant body of members will rip up their union cards - particularly those working for the BBC. Quite possibly a chunk that favour Scottish independence will depart at the same time. It is easy to imagine the union losing as much as a quarter of its membership within a year of such a move. The resulting fall in income would be enough to call the union's continued independent existence into question. If there is a ballot, I am confident that NUJ members would reject such a foolish move - not least because of the result when there was just such a ballot in 2004. Even holding a ballot, however, will cause some good members to consider resigning, as well as costing around £25,000 to organise and distracting our officials from far more important work. If you find my argument persuasive, and you are going to be at our Delegate Meeting in Southport later this month, then come prepared to vote against the political fund motion. If not, then why not contact the officers of your branch or chapel and tell them what you think about this proposition? Making the right decision now will save heart ache and precious resources in the near future. For a union that intervenes effectively in the political realm, a vote against establishing a political fund is vital. The NUJ has held only one ballot in which members were asked whether they wanted a political fund or not, in 2004. Then 53% voted against the establishment of a fund, 47% voted in favour. The closeness of that result might make the issue appear potentially fluid. That ignores, however, the quite different circumstances pertaining 14 years ago. The move to create a political fund came at the 2003 Delegate Meeting. A motion called on the National Executive to ballot members on the the establishment of a political fund. The NEC at that time decided, however, not only to hold a ballot, but also to campaign for a "yes" vote. I was a member of the NEC at the time and, with a couple of others, argued that this interpretation of the instruction was perverse. My suggestion was that the union's ruling body should take a neutral stance in the ballot - or at very least accept that there would be opposing campaigns. My proposal was rejected. The union's staff time and central resources poured into the "yes" campaign. Chris Wheal and I organised a "no" campaign financed from our own pockets. The then editor of the Journalist Tim Gopsill convened a campaign group to push for a "yes" vote pulling in members from all the unions councils and other elective bodies. Were there another ballot today, however, the situation would be entirely different. So far as I can tell, only three or four members of the National Executive would favour a "yes" vote. The General Secretary has several times spoken against the establishment of such a fund, and I am aware of no great enthusiasm among the membership for this move. A fresh ballot can only sow division, burn resources and distract us from the many vital campaigns our members really do need. 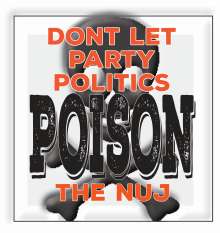 Please, don't let politics split the NUJ.